It isn't a lego terrorist... really. A pal of mine picked this up for me from a bin full of them at the Lego imagination Station in the Mall of America. 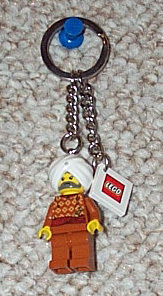 While, they are keychains promoting the recent Lego "Orient Adventure" theme, it struck my friened that this particular character with a scruffy beard and turban looked rather like a middle eastern terrorist. He found the idea of a whole bin of little Lego terorists to be utterly hillarious so he brought me one. Somehow I doubt the Lego Corporation would find this even remotely amusing... but then my friend is more than a little odd.